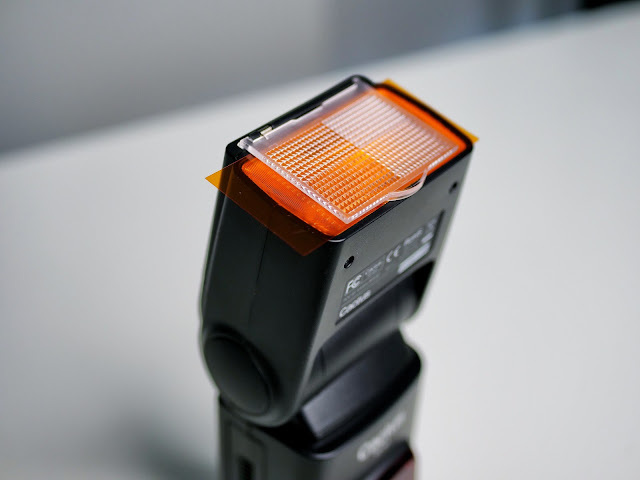 A Visual Science Lab Blog Reader asked, "Why filter your flash?" Here's the answer: We tend to believe that the automatic white balance in our cutting edge cameras will be able to correct for any color inaccuracies in the scenes we encounter when photographing. Many think that this will work by blending or mixing the various color casts together in one file which will somehow be correct; but rarely is. Here's the prevalent scenario for event shooters: We are in a large room that is lit by tungsten light bulbs. There is a tungsten spot light (or two or three) illuminating a keynote speaker. We need to take images of people talking together at their tables, conversing together at the back of the room and also watching the speaker. In short, we need to handle a range of shooting situations in an environment where the entire room is lit at >3200K while our lighting (and motion freezing) instrument is color balanced for somewhere between 5200 and 5600K. If we use the flash with auto white balance engaged on our camera then whatever is lit by the flash will be close to normal while the some much warmer light contaminates the edges of the subject and the background goes red/orange. It's not a great look. If we want to have the room show up in the frame (with the subject in the foreground) then we have to find a shutter speed/iris/ISO combination that provides an exposure in which the main subject is lit to a good exposure and the background of the frame is also lit enough to see details and bring up the general exposure of the room. That might be 1/30th of a second, f4.0 at ISO 1250. If we do this then the room light contaminates the main subject to a much greater extent because there is very little difference in the amounts of mixed lighting hitting the subject and the background. But, if we put a correction filter in front of the flash which converts the flash color balance from daylight to something much closer to the ambient illumination's color temperature then we're shooting under two light sources that are much closer in character to each other. Since the filter provides a known color temperature we can easily select the lightbulb icon in our white balance menu or we can fine tune with a set Kelvin number to best match the two light sources. Now when we shoot a frame of the two guys talking in the back of the room, illuminated by ambient light from overhead and flash from the front the two light sources are close enough to be homogenous and the scene is more natural to our eyes and less contaminated by mixed colors. I find that exposing this kind of work is best done in the manual exposure setting because one can use the shutter speed setting to increase or decrease the overall illumination of the ambient portion of light without changing the amount of flash on the subject. Through trial and error we can have a background/foreground ratio that is nearly equal or we can dial down the background light so the subject stands out more. We can control flash via the power setting on the flash or by changing the aperture. If we change the aperture to affect the flash we can compensate for the change to the background with our friend, Mr. Shutter Speed. Done this way you never have overly warm flesh tones or horribly murky backgrounds. You could, of course, create your own color style by picked a filter and a color temperature setting that is halfway to tungsten and letting the background go warmer or you can filter the lens and leave the filter off the camera to get the same effect as described in our initial example but I can almost guarantee that filtering the lens is going to require a couple of stops more power and exposure and will make autofocusing nearly impossible. One part of the equation remains; what to do about the speaker on stage? Well, if the stage is well and amply lit you don't need to do much more than identify the color temperature of the fixtures being used to light him or her and then set your camera accordingly. Turn off your flash altogether and snap away. In my example from last Friday it was pretty obvious to me that the fixtures were tungsten balanced and that cued me to set the camera to 3000K (most lighting people use dimmers to pull the lights down a bit so the speaker doesn't get the "deer in the headlights" look) to get a nice, neutral color balance. If I don't use flash I don't annoy the audience or the speaker, and if I'm using a state of the art mirrorless camera I can shoot in complete silence and pound away at anywhere from 12 to 20 fps to capture the "magic moment ==== I don't though because it's a lot more fun to practice catching the right expression through anticipation and faster reflexes. And it makes it so much easier to wade through the files in post. To re-cap: Make all the light sources as close to the same as you can. Filter your flash to match the vast ocean of available light in the ballroom, meeting room, convention or conference center and then set the right white balance for the filter in your camera's WB menu. Use your shutter speed to change the ratio of the ambient light in relation to flash. Use aperture to increase or decrease flash exposure and then restore your ambient/flash balance with the shutter speed. Shutter speeds too low? Flash not powerful enough? Don't be afraid to increase your ISO. And that's how I generally handle lighting mismatches and why. Thanks for asking!